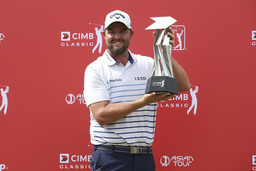 KUALA LUMPUR, Malaysia (AP) Marc Leishman shot a 7-under 65 in the final round to win the CIMB Classic Sunday by five strokes and equal the tournament course record. "I feel unbelievable right now," Leishman said after securing 500 FedEx Cup points for his victory. "I knew that even though I got off to a good start, I still needed to grind because there's some tough holes out there. Managed to hit some good shots and this is the result. It's great to get back in the winners' circle, excited to be back in Malaysia and leaving with this." Leishman plans to celebrate his victory "with some beers." "We'll sit that (trophy) in the middle of the table tonight and have a few beers and just talk about it and just have a good night with friends really. I'm looking forward to doing that tonight." "Disappointing, not really happy with the way I finished. But again, as always, a great experience for me going forward and I think my game is in a good state for the next two weeks," Sharma said.